Registration for AEC 2018 is now OPEN! There could not be a more promising venue for bringing together the energy industry’s leading researchers, entrepreneurs, financial executives and venture capitalists, government officials – with energy-focused companies or organizations like yours. This is where innovation and opportunity converge, and where industry leaders come to discover the next big thing in renewables and energy technologies. Don’t miss out on our biggest event yet! 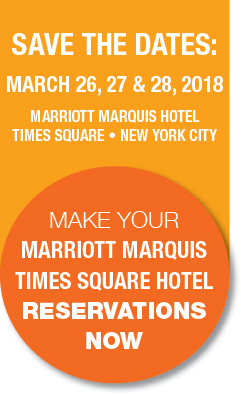 AEC 2018, held at the Marriott Marquis Times Square, NYC, is offering big savings in Early Registration - rolling our attendee prices back to our AEC 2012 fee – save money and register now! AEC 2018 will host focused workshops on March 26, 2018 followed by two full days of keynotes, plenaries, panels and speakers who represent leaders in every segment of energy research, policy and business. And be sure to make your hotel reservations today to stay at the Marriott Marquis Times Square during the event! AEC 2018 has negotiated a deeply discounted room rate for the conference attendees! For group rates, please contact Kathleen Ferrell at Kathleen.ferrell@stonybrook.edu. Free to attend the Tuesday Evening Poster Session and Reception ONLY with a special discount code received from Mr. Adam Ortiz at Adam.Ortiz@stonybrook.edu. Approved Poster Presenters are eligible for a $50 refund on student admission prices when registering as a Full Conference or Tuesday only attendee. A refund request must be submitted by email to Mr. Ortiz within 7 days post AEC 2018 showing payment and requesting refund. If you have registered for the two-day event and cannot attend one of the days and would like to substitute someone in your place, please contact Kathleen Ferrell at Kathleen.ferrell@stonybrook.edu. Checks must be received no later than Monday, March 11, 2018. No checks will be accepted on-site. Information on submitting a PO must be made in writing to Kathleen Ferrell at kathleen.ferrell@stonybrook.edu. Receipts will be provided upon written request; please allow 72 hours for response. As of March 14, 2018 there are no cancellations (final numbers due to Marriott); however, you can substitute a guest in your place. There will be no exceptions to the above policy. Additional tickets for sponsors and group rates are available. Please contact Kathleen Ferrell at kathleen.ferrell@stonybrook.edu or 631.216.7114.